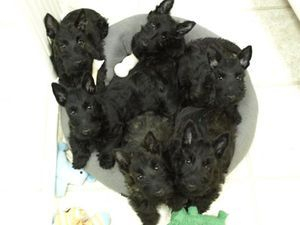 If you think you want a Scottie, then you need to find a knowledgeable, reputable, and ethical breeder. A good breeder will want to know how the puppy is getting along, will stay in contact with you after the sale, and will be there as a source of information and guidance. A good breeder will stand behind his or her puppy for the long haul and will take the puppy back for the full purchase price or replace the pup if things don't work out. Good Scotties are worth waiting for. Most good breeders do not always have puppies available, and seldom have more than a few litters a year. You may have to wait until puppies are ready to go to a new home. Don't be so eager that you grab the first puppy available, even though you suspect that breeder is not the best you can find. Contact the breeder frequently. The breeder wants to get to know you too. Send some details about yourself and be ready to complete an adoption questionnaire. Write frequently. A good breeder will want the puppy to go to a home where it will be safe, well cared for, and loved. A good breeder will ask for references and will want to know that you have a good vet and groomer available to you. Some people are looking for a bargain. Because the pup has AKC papers does not mean it is a quality puppy. In reality you get what you pay for. The AKC is not a seal of approval. It is only a registry. The puppy you adopt will be your family member for a lifetime. So take the time and do your homework to find the best breeder and the best puppy you can. How much can you expect to pay for a Scottie puppy? The price for puppies will vary somewhat across the country. That said, you may see this price and possibly more for a puppy in a pet store and even in some ads in the newspapers. The price does not always predict the quality! BEWARE OF THE PET STORES! They obtain puppies from puppy mills. Every puppy that is bought from a pet store dooms its mother to more misery in a puppy mill, living in a cage, and having litter after litter. Run, don’t walk, away from pet stores that sell puppies. Newspaper ads for puppies are often placed by people who are breeding for cash only and/or who don't have the knowledge needed to produce quality puppies without health problems. 1) Are you a member of the Scottish Terrier Club of America ? The STCA is the only recognized arm of the AKC for Scotties, and it is not easy to gain membership. We must have two sponsors and sign a strict code of ethics. From an STCA member you will get a good-looking Scottie that has all the great Scottie traits, as well as a loving personality, and you will gain the support of a conscientious breeder. 2) Have you tested your dogs for vWD? vonWillebrand's disease is a bleeding disorder which can be fatal. We now have a DNA test available to identify Clear, Carrier or Affected dogs in our breeding stock. If the breeder has no knowledge of vWD or other health problems such as Cerebellar Abiotrophy (CA) or Bladder Cancer or Thyroid disorders, be very careful. 3) Have any of your dogs ever had the following diseases? * CMO (Cranial Mandibular Osteopathy) is a genetic disorder of growing bone in a young dog, most frequently in the jaw. CMO is extremely painful, but can be treated and the pup will ultimately outgrow it. * Liver Shunt is another fatal, genetic problem that often does not show up until the pup is 4 or 5 months old. * Thyroid disorder. Hypothyroidism causes hair loss, weight gain, greasy coat, lack of energy, reproductive problems, and often the dog will suffer with a lifetime of allergic skin disease and poor hair growth. Hypothyroidism often runs in families. * How much do the sire and dam weigh? If the breeder is not aware of the AKC standard, and the dogs are over sized or undersized, then they may not be well bred. Males should weigh 19-22 LB and females 18-21. Go to the website of the AKC (URL below) and print the Scottie standard. Be familiar with it when you ask questions. GO and SEE the facility where your puppy is raised. Is the facility clean? Make sure you see the parents of the puppy. Are they friendly? The pup will reflect the disposition of its parents. Unfriendly parents give birth to unfriendly dogs. All pups are cute! Do not trust what you hear. Go see for yourself. A puppy is for life. It is important for you to see where it is born and raised. The breeder should be happy to show you every building where dogs are kept. It is VERY HARD to walk away from a cute puppy, but you must if you doubt even for a minute that the pup is not well bred or healthy or well socialized. In the long run, your plane ticket will be less expensive than the price of the puppy with health or temperament problems. 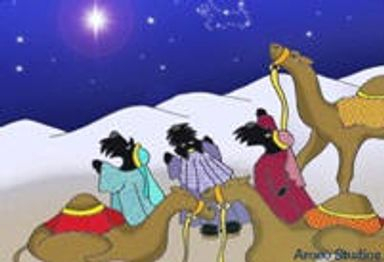 Thank you to Charla Hill and Marcia Dawson for composing this page.